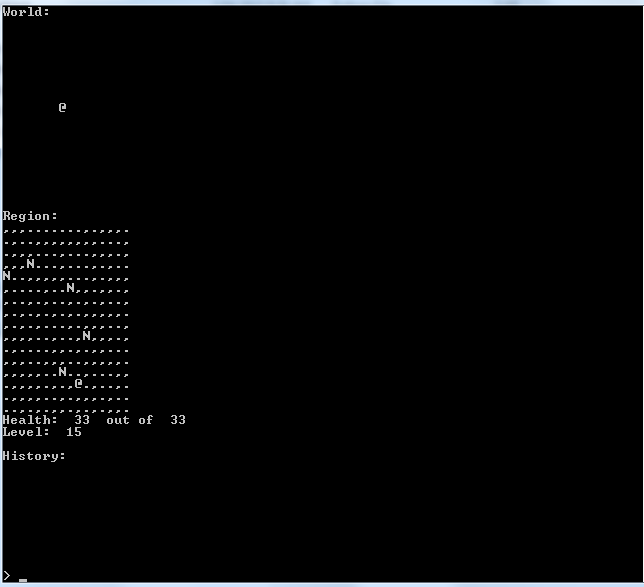 This screenshot shows some teaser code, and a demonstration of my ASCII map, with a rogue-like at-sign-character carelessly splashed across the map. I am starting a new category corresponding to blog posts that relate to a school project I need to be doing. It also needs to be a text based adventure, but I won’t be redesigning Zombies for that, I also won’t be making an engine for this, but rather just a normal text adventure implementation. A map system incorporating rooms and/or areas. An inventory which has functional contents that can be manipulated. In terms of personal interests I’m going to be exploring the way that grinding/monotony exists as a trope in RPGs, and how that is/isn’t optional, as well as the applied ways that item functionality interacts with crafting + recipe systems in terms of things which I don’t fully know how to explain at this time. For the text based project I am working on, I am embracing a thing called lasagna code, the use of distinct layers in a program’s structure. Since I am using C++, these layers also show in my file structure, I have main.cpp, command and eco.cpp, all alongside their relevant header files. Lasagna code to me has two main good points, and one main bad point. Most of the time we forget the details of our programs almost as soon as we stop working on them for a few minutes, but having a visualization of how you made something makes it much easier to remember how it works. Spaghetti code tends to just be spoken in a stream of consciousness, and is much easier to forget as a result. It is easy to visualize separating layers of cooked lasagna; you have two distinct layers of pastry separating without objection, and a whole lot of meat/vegetarian filling that doesn’t know which way it wants to go. That is exactly what seperating layers of lasagna code is like, your two main functionalities (in my case, user input and world/item management) are easy to identify and seperate, in fact they are already completely separate, their is no interaction whatsoever between command and eco.cpp; the interaction happens in commands.h*, which has functions that take input interpreted by command, to pass that input to world functions in eco.cpp. By replacing the user input layer with an autonomous layer you can create bots to run a ‘simulation’ instead of a game. Creating an output layer on top of this would give you a finished product. By replacing the system of input, you could create a windows based application and set up your own gui to collect input, but once you have done that, if you are passing the same strings to the rest of the program, command and eco.cpp remain completely unmodified. Dealing with multiple layers of code can be bothersome. which quite simply specifies the string the user should enter to invoke the command, the function that will interpret the other arguments, and the delimiter that that part of the function will use. This is all neat and fine, and this is what I had in mind when I decided to use lasagna in my coding style for this project, but it makes the production of secure code just that little bit more bothersome when you need to create checks for invalid LocId input, and then pass back a return value that represents that, and then interpret that again to determine what to display on the screen. Basically what you are actually doing when using lasagna code, is developing a number of discrete API systems, and integrating them in a way that gives you an actual product to debug and play with, instead of the much more lifeless alternative of creating an API entirely without using it, which sounds fun, but can slow down quite quickly if you are an indie game developer instead of a large company with monetary incentives. So despite the massive pain, I would recommend it if you are planning on doing versatile things with your program. Three layers to integrate at once will save you making three entire reproductions of the program, and that is reassuring. If you are working on a small learning project, or a proof of concept, just throw it together; if it compiles right, it doesn’t matter how you did it until you want to make changes to the program – save the serious and secure building for when that happens. as opposed to the former file, which is in the same directory as main.cpp. I plan to develop the graphics based project in a lasagna format as well, it is just that for the time being I am focusing on getting win32 working well, and am not actually working on gameplay at all at this stage, for obvious reasons. I have already started to separate my file structure though, and I know how I am going to place my layers when I do.